From custom pen and ink memories to pencil sketches I create, this blog will cover “What’s New” at TerpCreek.com. Drawing, interesting facts and wooden barn quilt blocks! Pictures and information of upcoming events and shows. Art as the focal point of a room. The first drawing for the car showcase is now in Detroit for approval. After they OK the drawing I will finish it up and start on drawing number 2. The finished showcase will measure 15 feet long, which will take a total of 9 drawings. Each drawing is an old storefront. This is really a neat project! Today’s topic is art as the focal point of a room. Artwork as the focal point of the entire room can be one large drawing or a collection of smaller drawings. If only one drawing is used it should be large enough to catch your visitor’s attention but small enough that it does not over power or distracts from the balance of the room. If you have a large wall space or a shelf in the room then a collections of complementary drawings along with some figurines, greenery or other suitable decorations will look great. The main idea is to not overwhelm the room and keep it within the relationship scale to other items. The room should reflect your personality as well as your home décor. Another factor that is very important is framing the art. Framing and matting plays a big role in the final outcome of the room. 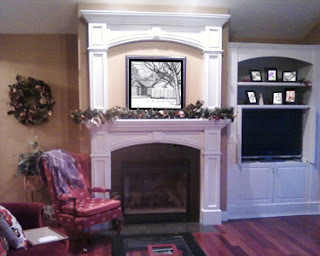 The frame should be evenly balanced with the picture and the room. You do not want a heavy frame on a small piece of art in a little girl’s room or a thin pink frame accented with a football trophy in a boy’s room. 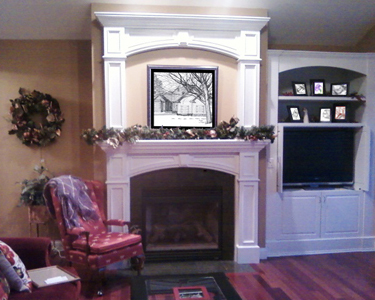 Nice thick frames are good on large drawings and in rooms that can balance the focal impact. The mat color needs to complement the room and art at the same time. Sometimes this is a challenge. My clients are becoming more aware of the way the art works with the rest of the room or maybe I just have got a high class of clients. Either way I am doing more that just drawing. I am getting into more of a decorating business to complement my drawing business. Often I go to the client’s home and we figure where the drawing will hang, how many drawings are going into a display and if we need accent pieces. The final drawings are then assembled on the wall with added accent pieces so the clients can just set back and enjoy the outcome. So next time you buy art think about where you are going to hang it, if you need accent pieces, if it reflects your personality and if it will go with the whole balance of your room.